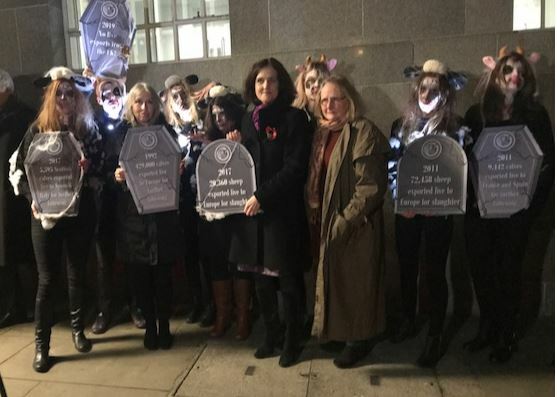 Theresa Villiers MP urges for an end to live animal exports as petitions totalling 1.3 million signatures were handed to Defra on 29 October. 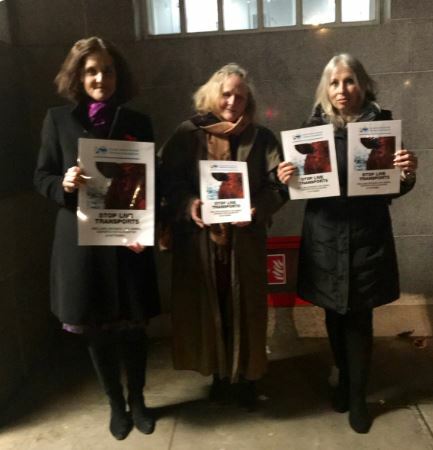 Conservative Animal Welfare Foundation volunteers joined Peter Egan, Compassion In World Farming and The Sum of Us outside Defra’s offices in Westminster. 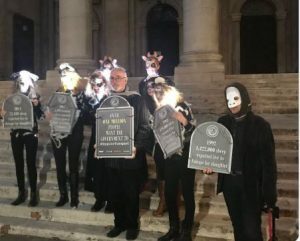 The 38 Degrees, Avvaz and the Sum of Us petitions to ban live animal exports signed by £1.3 million members of the public was handed in to DEFRA amongst a photo shoot themed for Halloween to help raise action to end the trade. Our Co-Founder Lorraine Platt said: Live Exports is a grim, vile trade and needs to end. Every year over 400,000 live sheep and cattle are exported from the UK mostly for slaughter abroad. The animals suffer long arduous journeys in overcrowded conditions resulting in pain, stress and frequently injury. Brexit presents us with a unique opportunity to end this trade outright when the UK leaves the EU. It is vital that we press for this ban to ensure that it is not diluted or abandoned in favour of improving conditions for animals sent for export as they will continue to be exported to systems which are illegal in the UK such as veal crate systems. The UK banned cruel veal crates and Sow Stalls. It’s time to ban live exports for slaughter or fattening.